The dough to this vareniki recipe is as classic and traditional as it probably gets, as the ingredients called for are very simple and no mixing equipment is required. This recipe is from my elderly aged aunt that has been cooking probably more than half of her lifetime. 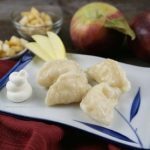 If you have never tried apple stuffed vareniki you truly need to give these a try! I absolutely love the semi-sweet apple filling and the texture of these vareniki. These stay pretty true to size when cooking as some vareniki recipes tend to get enormous while cooking due to rising agents such as baking soda or powder. Now my aunt makes her vareniki with homemade сироватка also known as whey (the liquid after milk has been curdled and strained.) But the best store alternative would be buttermilk as both liquids are sour. The thing with buttermilk is that it runs slightly thicker than homemade whey, which results in more quantity use. Feel free to delude buttermilk with milk or water to slightly thin out the consistency but plain buttermilk works great with just as good of results to the original recipe. Give these a try I’m sure they won’t disappoint. Combine, flour, salt, oil and buttermilk in a large sized bowl; stir with a wooden spoon until the dough comes together than lightly knead adding more flour if needed to form a delicate dough. Dough should be soft to the touch and slightly tacky. Since flour may vary; add an additional 1 tbsp of flour until dough comes together nicely. (I used bakers rose Canadian flour). More flour will be used during the sealing process so don’t add too much flour at this stage. 2. Cover the dough and allow to rest. While you prep the apples. 3. Peel, core and dice two apples; place into a shallow bowl. TIP: DO NOT SHREDD the apples. Cubing the apples and adding sugar right before sealing the vareniki prevents juices to run from the apples. Do avoid to not let sealed vareniki sit too long as juices may start to release when sugar is added. 4. Bring a large sized pot of water, about half way full to a boil. 5. On a lightly floured surface, divide dough into two equal parts. Working with one piece at a time, roll dough out into a 16″ by 1 1/2″ wide log. Then slice log into 1″ pieces. Cover dough as you work. 6. 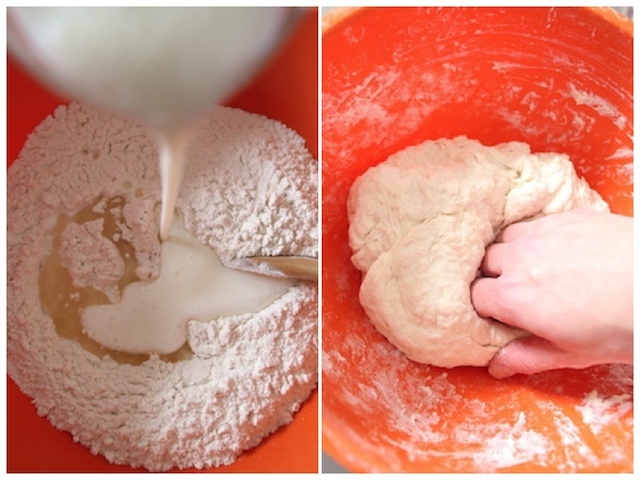 Roll each 1″ piece of dough into a ball then flatten into a disk (about 2-3″ wide.) Place 1/2 a tsp of apple pieces then sprinkle with a pinch of sugar (about 1/4 tsp full.) Seal pinching tops together. 7. 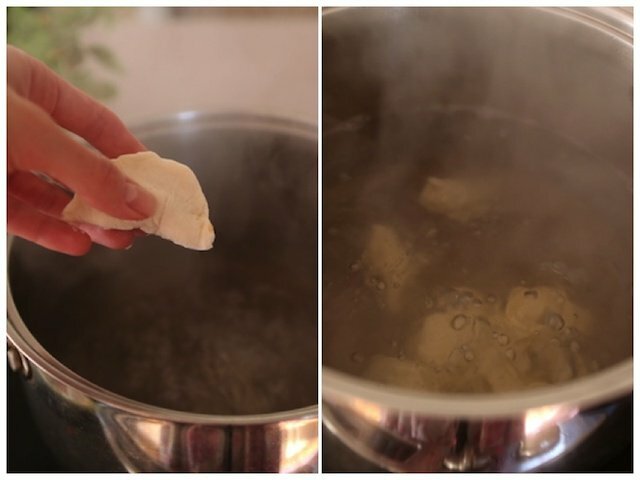 Once water has come to a rolling boil; reduce heat to medium-high and place 5-8 sealed vareniki into the boiling water. Boil for 4 minutes. Continue sealing and cooking vareniki in small batches. 8. Place ready vareniki in a small bowl with some butter and sprinkle 1 tsp of sugar for each 5-8 vareniki. Serve with sour cream if desired. Combine, flour, salt, oil and buttermilk in a large sized bowl; stir with a wooden spoon until the dough comes together than lightly knead in the bowl, adding more flour if needed to form a delicate dough. Cover the dough and allow to rest. While you prep the apples. Peel, core and dice two apples; place into a shallow bowl. Set aside. Bring a large sized pot of water, about half way full to a boil. Meanwhile, on a lightly floured surface, divide dough into two equal parts. Working with one piece at a time, roll dough out into a 16" by 1 1/2" wide log. Then slice log into 1" pieces. Roll each 1" piece of dough into a ball then flatten into a disk (about 2-3" wide.) Place 1/2 a tsp of apple pieces then sprinkle with a pinch of sugar (about 1/4 tsp full.) Seal pinching tops together. Once water has come to a rolling boil; reduce heat to medium-high and place 5-8 sealed vareniki into the boiling water. Boil for 4 minutes. Continue sealing and cooking vareniki in small batches. Place ready vareniki in a small bowl with some butter and sprinkle 1 tsp of sugar for each 5-8 vareniki. Serve with sour cream if desired. Vareniki Is my favorite!! When ever we make these, they taste so so good, and it brings a lot of memories from my childhood when my mom use to make these. Thank you.